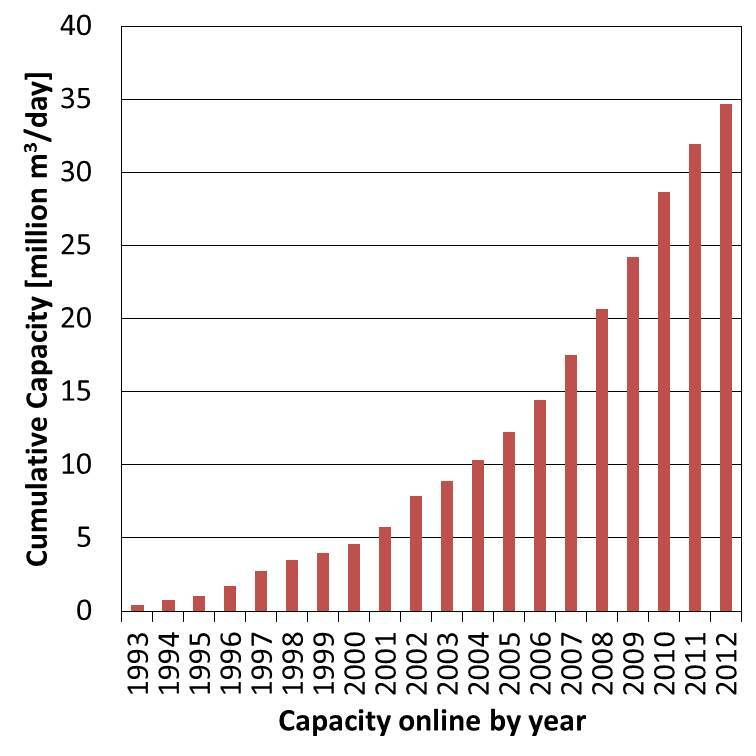 Seawater desalination – the filtering of water from the sea – is one of the world’s rapidly growing supplies of freshwater, with world production growing at over 10% per annum in the last decade, as shown in the figure inset. Historically, desalination developed as a means of providing freshwater in arid countries of the Gulf region (Saudi Arabia, Qatar, Oman, UAE), where little or no freshwater supplies existed. More recently, a wider desire for desalination has come about as a result of growing populations in regions where freshwater supplies are present but limited in supply. Major cities in Australia, Singapore, Spain, India and most recently, with the Carlsbad desalination project, in California, U.S.A., have adopted seawater desalination as a complement to existing natural freshwater sources. Where desalination has been proposed, it has always been questioned. As put by the New York Times, desalination is often viewed by its critics as an “energy-sucking, environmentally damaging, expensive white elephant”. My objective is not to demonstrate that this is false, or indeed true. Instead, my goal is to convince you that desalination is very different, in cost, in energy requirements, in reliability and in environmental impact compared to alternative and complementary water sources, and, that desalination is so different it may bring us to realise how important it is for all four factors to be taken into account. Reverse osmosis pressure vessels at Swansea desalination plant, Massachusetts, U.S.A. 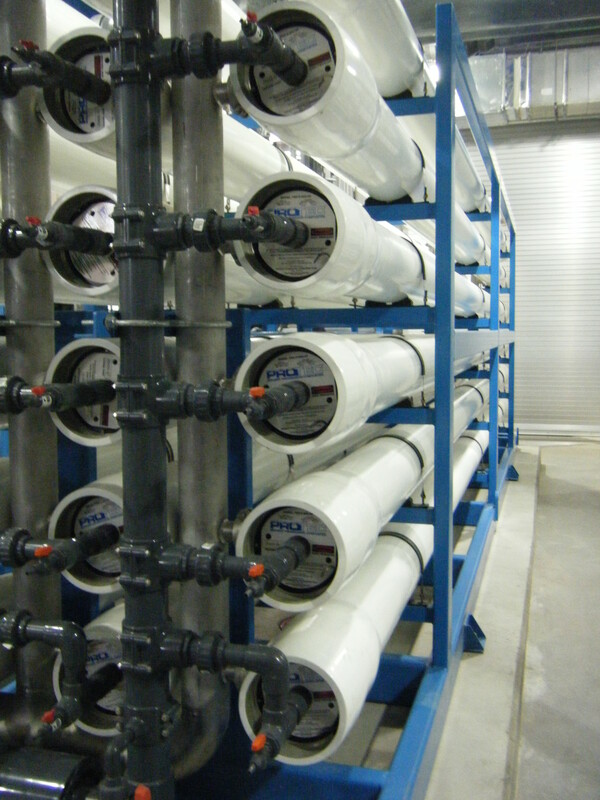 Though the process is termed “desalination”, reverse osmosis, the dominant desalination technology involves the removal of pure water rather than salt. Seawater is pumped at high pressure into the pressure vessels seen in the image inset. Within the vessels, the seawater comes in contact with a filtration layer of material that allows the passage of water but not of salt. At the pressure vessel outlet there are two streams – one the purified water and the other a concentrated seawater stream to be returned to the sea. The desalination of seawater provides a source of water that is inherently reliable. While rainfall may vary by year and depend upon season, seawater desalination is largely unaffected by climate and weather. That summer demand for water may increase while the supply from natural reservoirs decreases further plays in favour of desalination. The ability to guarantee a portion of a region’s water supply is a valuable proposition. This was the strategy employed in Victoria, Australia, where a 150 billion liter per day plant was constructed following a period of water shortage. Since then dams have remained at high enough levels for the multibillion dollar plant to lie idle. Though it is politically challenging, and perhaps unfortunate, the Victoria desalination plant is evidence of a strong desire for municipalities to provide a guaranteed supply of water. When water supplies fall short of what a region requires, the environmental impact of securing new water sources is often significant. An excellent example is the relocation of water over more than 700 miles in California, from the Sierra Nevada mountains and valleys of north and central California to Southern California. Pumping water over such distances requires very significant energy, up to the level required for seawater desalination. In addition, construction projects covering such long distances clearly have a significant impact in disrupting landscapes and often populations. Also important, is the question of how the water supplies of those in northern regions are affected if water is relocated south. A second example is the over-extraction of groundwater in Tamil Nadu, India. In this case, by attempting to meet growing demand for fresh water with further extraction from limited underground reserves, seawater has percolated into the aquifers turning the waters salty and sometimes undrinkable for future generations. The piping of water through long distances, or the over-extraction of water from rivers or lakes can clearly have environmental effects that are far reaching in space, as in California or in time, as in Tamil Nadu. While not necessarily better, or comparable, the impacts of seawater desalination are largely localized and restricted to within a few hundred meters of where water is taken from the sea and concentrated water is sent back. In seawater desalination, for every liter of seawater withdrawn, typically half a litre of pure water is retained and half a litre is returned back to sea at twice its initial concentration (7% salt by weight rather than 3.5% initially). The primary concern with the return of concentrated seawater to the sea is not that the ocean as a whole, or even regionally, would be affected. Within hundreds, if not tens of meters from the discharge, concentrations return to ambient seawater levels. The primary concern is with the impact upon marine life within this local zone, as well as marine life and features that may be entrained where water is drawn in. To some extent these impacts can be combated through wetland restoration projects, as in Carlsbad, California, and the careful design of water inlets and outlets to keep the speed of flowing water low. The environmental and indirect economic impact of desalination is certainly present but it is very different from that of traditional water sources, thus making it difficult, in dollar terms, to draw comparisons. It is certainly true that to treat seawater rather, than freshwater, to drinking water standard requires significantly more energy and money. While filtering fine particles and disinfecting freshwater requires little energy, to filter a liter of water from a seawater solution takes energy equivalent to leaving a 100 W lightbulb on for two minutes. With a per capita water consumption upwards of 500 litres per day in the developed world, that quantity quickly becomes significant. Water from a desalination plant will also most likely cost more than twice what it would to have water from municipal freshwater sources delivered to your home. While in relative terms this may seem large, in absolute terms the cost of desalinated water is well below $0.005 per liter, far below what we regularly pay for bottled water. The greatest danger of these comparisons, both of energy and of cost, is that because we have hard numbers to compare, we can allow our decisions to be dominated by considerations of energy and cost. Unfortunately, there is no reason to believe that the costs of water distribution or treatment systems capture in any significant way their environmental impact, or the long term economic consequences of such impact. In focusing solely on cost, we are most likely missing the most important considerations in making decisions. Desalination has emerged as a competitor and a complement to traditional water sources. That desalination is different – in cost, in reliability and in environmental and economic impact – should remind us that our decisions in choosing water sources should encompass much more than direct costs. Our choices affect our environment, the economic prospects of our industries and the well-being of mankind, present and future. Direct costs should never be the basis for our choice of water sources, but ironically, it may be the apparently high cost of desalination that brings us to this realization. Ronan Killian McGovern is a 2010 fellow of the Fulbright Science & Technology Award, from Ireland, and a PhD Candidate in the Mechanical Engineering Department at MIT. Can a small fish answer the big question?